Echolink is part of Voice-Over-Internet-Protocol. It’s an amazing piece of technology and can open up a new world to Ham Radio Operators who don’t have HF equipment to get on the air. Basically you can chat with other Amateur Radio Operators over your computer. Easy to set up, and once set up there are plenty of nets and forums all over the world you can enjoy. AND not only can you access nets and forums, but you can also access repeaters from other states that have an echolink connection. With all that said, let me give you the URL to learn more about Echolink….. http://www.echolink.org/ . The reason I bring up Echolink , is because I happened upon the service when the radio in the shack was out for repair. I met a great group of people from the South Coast Amateur Radio Group, got involved as a net controller and now have my own show Thursday nights. The program on Thursday nights is called TNT, or Thursday Night Thematic, and it all happens at 7pm EDT on the SCARS conference server. CONNECT TO *SCARS* ECHOLINK NODE 96140 OR IRLP NODE 9614! This week’s presentation is an interview with QRZ.com founder, Fred Lloyd! Please join me in welcoming Fred Lloyd, AA7BQ, founder of QRZ.com, to the Southcars TNT forum on Echolink. Time is 7:00 EDT on Thursday Oct. 27th, 2011. 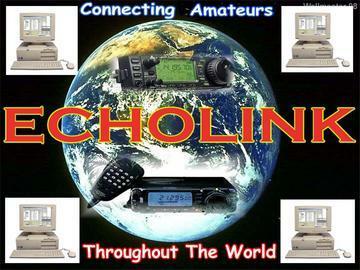 1 Response to Is Echolink Part of Your Ham Radio Life? I LOVE Echolink!!! Its helping me learn Russian right now!